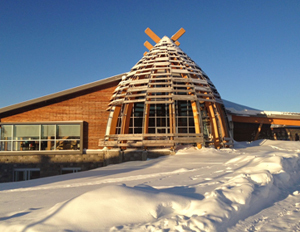 Learn our culture at the cree culture institute located in the community of Ouje-Bougoumou. On behalf of the members of the Ouje-Bougoumou Cree Nation, I would like to welcome you to our website where you will learn about the history of our Cree First Nation, our struggles, our successes and what you can expect to experience should you wish to visit us. 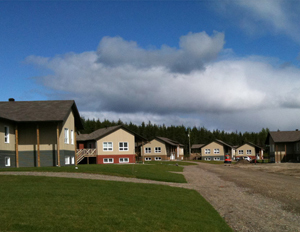 Our community of Ouje-Bougoumou was rebuilt in the 1990’s. It was rebuilt on the basis of a vision and a dream—the dream of our Elders in the latter part of the last century to be reunited once again as a community after decades of dispersal and forced relocations in order to accommodate the desires of the mining industry in the region. With determination and fortitude, that vision came to be realized under the leadership of former Chief Abel Bosum. Our people were content for centuries pursuing our traditional way of life based on hunting and fishing. In the early part of the last century, the Ouje-Bougoumou people welcomed the early prospectors to our region and escorted them throughout our territory helping them to survive in the sometimes harsh climate. As mineral deposits were identified in increased quantities more people entered our territory. Mining camps gave way to settlements which eventually gave way to towns. As the mining activities increased the Ouje-Bougoumou people came to be seen as an obstacle to industrial growth. We were forced to relocate our villages time after time to make way for new mines. Between 1920 and 1970, the Ouje-Bougoumou people were forced to relocate no fewer than seven times. We witnessed our villages repeatedly destroyed. And we were left, scattered, to live in deplorable conditions as "squatters" on the land we have occupied since time immemorial. But the Ouje-Bougoumou people refused to disappear. We decided to make our stand and take our rightful place in the region as the original inhabitants and the centuries-old stewards of the land. Our courage and our commitment throughout the years was sustained by our yearning to live together again as a community. That determination was translated into the building of a new village. An enormous creativity was unleashed which was applied to the construction of a new village. You will learn about this in our website. Since constructing our new village, we have been working to ensure that the same creativity and enthusiasm that went into the building of our village continues to sustain us and continues to guide us into the future. It is our hope that Ouje-Bougoumou can be an inspiration to Indigenous peoples everywhere to continue their struggles to build healthy and secure communities in the course of overcoming the consequences of colonialism. At the same time, we hope that our experience will be an inspiration to people everyone seeking to find more appropriate ways for human settlements to live with greater sensitivity to, and in harmony with, our natural surroundings.